The first clues regarding the function of genes appeared in 1902 when the English physician Archibold Garrod found that alkaptonuria, a rare disorder, was seen in families and was associated with the absence of an enzyme. In 1909, he predicted that the ability to synthesize specific enzymeswas inherited and that the inability to produce such enzymes resulted from an inborn error of metabolism—a prediction that was biochemically validated in 1952. Although the biochemical aspects of Garrod’s findings were appreciated, its genetic implications were neglected into the 1930s. Geneticists of the time believed that genes were pleiotropic—that is, each gene had multiple primary effects. In 1941 at Stanford University, geneticist George Beadle and biochemist Edward Tatum tested the concept that gene action could be examined in discrete biochemical steps, which they evaluated in Neurospora crassa, a bread mold. They exposed Neurospora to X-rays, causing mutations and changes in their nutritional needs, which differed from the non-irradiated, wild type. For their limited nutritional requirements, molds use metabolic pathways to synthesize all the other materials they require to survive. Beadle and Tatum found that the mutant molds were unable to survive on a minimal growth media because they were unable to manufacture arginine, an essential amino acid. The researchers concluded that the multistep biochemical pathway that synthesized arginine was defective because it lacked the enzyme required for its synthesis. Beadle and Tatum determined that the radiation-induced mutation produced a defect in a specific gene, resulting in a failure to produce a specific enzyme, and proposed the one gene-one enzyme hypothesis: the function of a gene is to dictate the production of a particular enzyme. Widely accepted at the time, it represented a unifying concept in biology, provided the first insights into the function of genes, and led to the emergence of biochemical genetics, for which Beadle and Tatum were awarded the 1958 Nobel Prize. Subsequent findings revealed that this hypothesis was an oversimplification, and that genes not only dictate enzyme synthesis but also structural proteins (such as collagen) and transfer RNA (tRNA). SEE ALSO: Metabolism (1614), Enzymes (1878), Inborn Errors of Metabolism (1923). Beadle and Tatum exposed the bread mold Neurospora crassa to ultraviolet rays to induce mutations in the spores, which have a reproductive function in fungi. 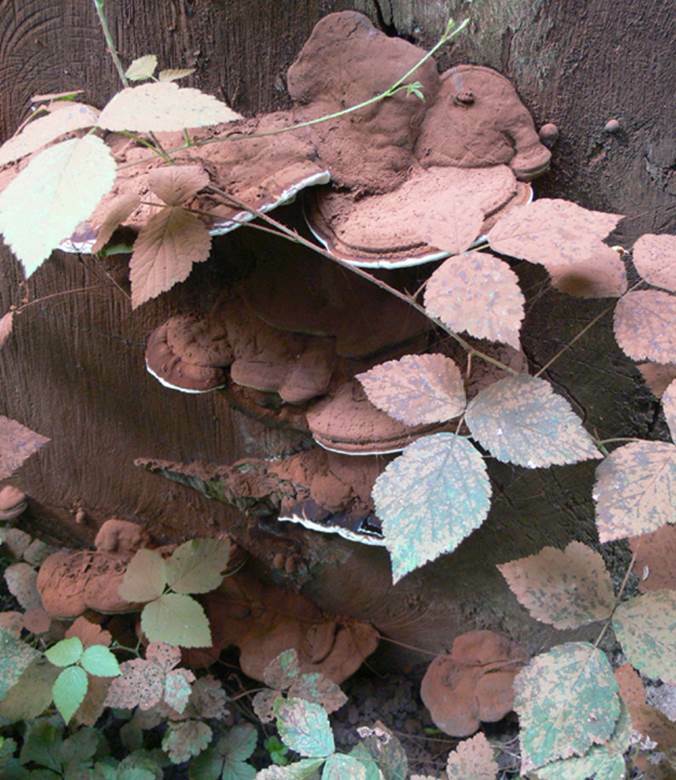 This photo depicts fungi-type polypores just after sporulation.